This is a list of the different copyright policies of academic publishers. Traditionally, the author of an article was required to transfer the copyright to the journal publisher. Publishers claimed this was necessary in order to protect author's rights, and to coordinate permissions for reprints or other use. However, many authors, especially those active in the open access movement, found this unsatisfactory, and have used their influence to effect a gradual move towards a license to publish instead. Under such a system, the publisher has permission to edit, print, and distribute the article commercially, but the author(s) retain the other rights themselves. Even if they retain the copyright to an article, most journals allow certain rights to their authors. 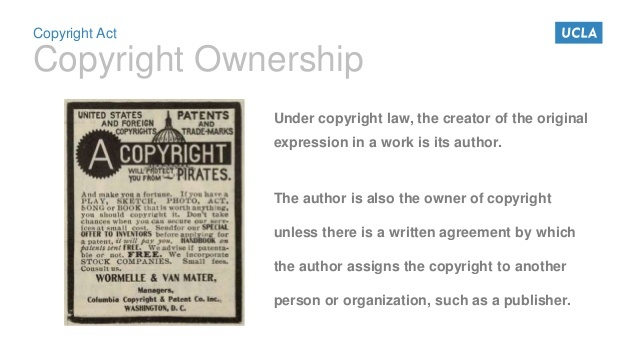 These rights usually include the ability to reuse parts of the paper in the author's future work, and allow the author to distribute a limited number of copies. In the print format, such copies are called reprints; in the electronic format, they are called postprints. Some publishers, for example the American Physical Society, also grant the author the right to post and update the article on the author's or employer's website and on free e-print servers, to grant permission to others to use or reuse figures, and even to reprint the article as long as no fee is charged. The rise of open access journals, in which the author retains the copyright but sometimes needs to pay a publication charge, such as the Public Library of Science family of journals, is another recent response to copyright concerns. author-prepared files only (i.e. not the published PDF) on free-access E-print servers. "AIP Advances" authors may make their work available according to the terms of the Creative Commons 3.0 Unported License. Distribute preprints (author prepared files), on the authors website or on preprint servers. Distribute other versions, including the final and further updates, on the authors website or on preprint servers, as long as they were prepared and formatted by the author (i.e. not the PDF prepared by APS). Distribute the published version (i.e. the PDF prepared by APS), in the authors website as long as no fee is charged. A citation and notice of the APS copyright must be included. to submit the author's version of the accepted paper (the unedited manuscript) to a funding body's archive, their institution's repositories, or their personal websites, for public release six months after publication.